The NECO Salt Recycling System provides a significant improvement to water softener regeneration efficiency by reducing the amount of salt usage by 25% with no loss in treated water quality. Operating efficiencies from 2,660 to 4,440 grains hardness removed per pound of salt used are assured regeneration after regeneration. Using 6 lb salting can further increase the efficiency greatly and does not need to be paired with a salt water system. NECO High Efficiency industrial water softeners utilize a system of integrated components selected for optimum performance and reliability. Ease of field service and availability of parts are also important criteria in the selection of components. NECO high capacity resin is of uniform bead size possessing high exchange capacity and low pressure loss combined with excellent stability over a wide range of operating conditions. Individually sized cast iron bodied diaphragm valves arranged in a galvanized steel piping module according to the flow pattern of each mode of regeneration ensure reliable and efficient operation. Flexibility of design is possible without the use of auxiliary service valves associated with multiport control valves. Automatic by-pass during regeneration is provided on single units. The regeneration modes are automatically controlled by an adjustable sequence timer signaling a staging pilot which in turn actuates the diaphragm valves. The sequence timer offers 5 adjustable regeneration steps, two of which control the Salt Recycling feature, to provide a significant reduction in salt usage. Time clock initiated with means for manual operation is provided as standard. Meter initiation is suggested to provide the maximum benefit of our salt recovery system. (See meter options). 30 psi minimum pressure required to ensure proper brining. 100 psi maximum pressure with standard units. Equipment available for higher pressures. Standard equipment is suitable for water up to 120° F. Custom fitted equipment is available for higher temperatures and special applications. 110 volt, 60 hertz, 1 phase AC power is standard. NECO controls are available for other electric requirements. Electrical enclosures are NEMA 12 rated as standard. Other NEMA ratings are available on request. The resin tank is fabricated of heavy gauge carbon steel, electrically welded and double hot dipped galvanized overall after fabrication. Tank supports are fabricated of structural steel with anchor pads. 4″ x 6″ handhole access openings in both upper head and lower sidewall are provided on 20″ thru 30″ diameter sizes; a 11″ x 15″ manway in the upper head is provided on 36″ diameter and larger sizes. The resin tank is available fabricated in accordance with ASME code, certified, and stamped with standard pressure rating 100 psi working pressure – 150 psi test, with other pressure ratings available. Tank interior linings and exterior finish coatings, other than galvanizing, are available. All linings are applied over a sand blasted metal surface to ensure proper adhesion and complete coverage of all surfaces. Consult NECO’s sales staff for the proper lining, priming and finish coating for your application. The NECO hub-radial distribution system ensures utilization of the entire bed area during all flow rates and also minimizes channeling during periods of low flow. The hub-radial design features non-clogging strainers arranged in a radial network. The strainers are molded from polypropylene and the radial arms are fabricated from heavy duty PVC pipe. This construction provides the ultimate in corrosion resistance and long trouble-free service. The system uses a single layer of fine washed gravel to avoid intrusion of resin fines and eliminate wasted capacity in the bottom area of the resin bed. An inlet baffle type distributor is provided to properly distribute the inlet water and collect the backwash water. A water meter increases the efficiency of operation where demand is variable. Often times capital costs can be reduced by installing smaller multiple tank meter controlled softeners capable of regenerating several times daily. Electronic programmable with digital volume and flow display. Operates 1 to 3 softeners in single, alternating or parallel configurations. Utilizes full diameter non metallic turbine meter from 1″ to 2″. Electromechanical programmable with dial volume indicator. E. T. electronic digital display register is also available. Utilizes full diameter brass turbine meter from 1″ to 3″. Electronic programmable with digital data display. Electromechanical auto reset register is also available. Utilizes full diameter metallic disc or turbine meter from 1″ to 3″ with AWWA listing available. Electronic programmable with digital volume remaining, flow rate, totalizer and regeneration cycle indicators. 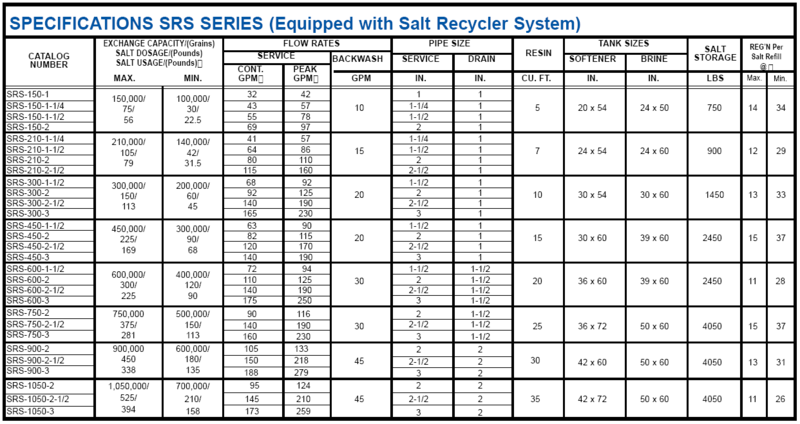 Operates 1 to 3 softeners in single, alternating, parallel or additive flow configurations. Utilizes insertion type paddlewheel flow sensor from 1″ through 3″. Lockout circuitry and components are provided to prevent simultaneous regeneration of multiple unit configurations. To provide one or more units in service with one or more units in a standby mode.This assures a constant supply of soft water without interruption. Resin tanks are mounted on a common structural steel skid. Prewired with single power connections. Prepiped interconnecting piping supplied with singlepoint inlet, outlet and drain customer connections. hydraulically with the system water pressure, or pneumatically with plant air. An automatic flow controller maintains the proper backwash flow rate over wide variations in operating pressure, utilizing a variable orifice concept requiring no field adjustments. The timer uses a calendar clock for flexibility in regeneration scheduling, with a means for manual initiation as standard. A motor driven multiport stager is coupled with the timer to automatically control each step of the regeneration cycle. The stager can be manually operated in the event of electrical power failure. The sequence timer is adjustable to allow for variations in operation conditions. either rock or solar type salts. All SALT-RECYCLER Brinemaker Tanks are factory sized to provide a minimum of 11 regenerations between salt refills and allow salt to be added to the top of the tank at any time without brine overflow and waste. Regeneration salt dosages are adjustable without disassembly or salt removal. and prevents fresh water refill to the Salt- Recycler Brinemaker. This feature assures that only recycled salt brine will be used to refill the Salt-Recycler Brinemaker thus reducing salt usage and operating costs. A PVC pressure compensating hydraulic injector is used to convey brine to the softener at the correct brine rate and concentration. Salt Dosage – The total quantity of salt required per regeneration to achieve the published Exchange Capacity. Salt Usage – The quantity of new salt required to obtain the published Salt Dosage. NEW Salt & Recycled Salt = Salt Dosage. @ Max. – Provides 2,660 Grains removal per pound of salt used. @ Min. – Provides 4,440 Grains removal per pound of salt used. At pressure loss not exceeding 15 psi. At pressure loss not exceeding 25 psi. Includes one Salt Dosage as liquid brine. Allow a minimum of 24 inches above HEIGHT dimension forloading tanks. 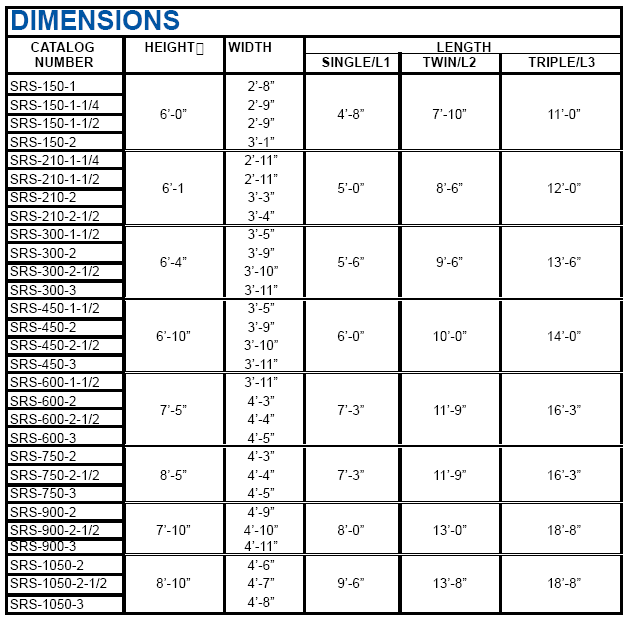 Add 10” to height dimension for A.S.M.E. tank construction.